You know the drill: if you aren’t either first author or last author on a journal article in the life sciences, then you’re really not able to use that work as evidence of research independence when you come up for promotion or tenure. In this week’s Nature, Gretchen Kiser of UCSF rails against the semiotics of authorship order. Right now, I’m working on a manuscript in which all the authors are listed alphabetically with the asterisk denoting that we have all contributed equally. But that’s stuff and nonsense also: perfectly equal contributions to a work of scientific research is as rare as the Ivory Billed Woodpecker. I don’t know what the solution to this mess is. As things stand our scientific identification (usually still denoted by our names) is the coin of the realm as far as credit and priority. Team science is indeed growing more common in many fields. As with Michael Lewis’ wonderful book on baseball, Moneyball, we may need new statistics to assess scientific excellence in the future. Interesting piece is here. All in all, good advice in my opinion…. From George Mason’s provost, Peter Stearns, here. His points on academic freedom are well taken. I also salute his concerns about productivity and salary distortions. De facto, tenure may be going the way of the dinosaurs. Specifically, institutions are using non-tenured faculty to handle increasing amounts of the teaching load. 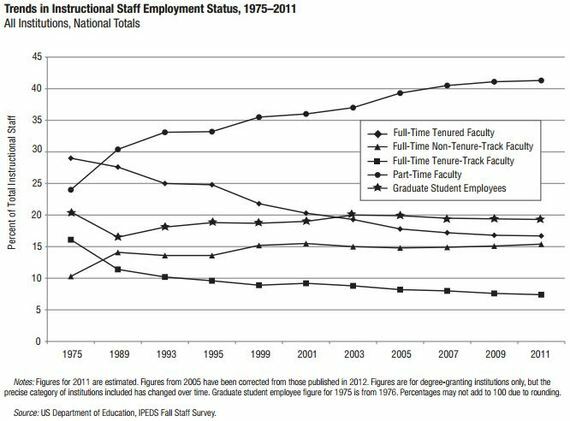 In fact, I would argue that as tenure faculty retire, they are being replaced by adjuncts or contract faculty members. The data show here suggest a low asymptote, where tenure is part of the compensation package for superstars while the bulk of the teaching will be increasingly handled by others. Here’s Mason’s provost, Peter Stearns, on the matter. My own sense is that he’s spot on. Even in the comparatively secure hard sciences, the “social contract” between institution and faculty is undergoing an evolution. A caution however: one of the US’s enduring competitive advantages has been its ability to attract top flight scientists from all over the world. The perception that either tenure or research support is being eroded will not help, especially in a global environment where countries like China and Singapore are pouring massive amounts of money to bring the best and the brightest to their own shores. The Financial Times, Lucy Kellaway has always been a must read for me, particularly her Martin Lukes series, which sadly ended with his fictional death in a parachute jump. In today’s regular Monday column, here, she takes on a much more serious issue: the rampant unemployment among young highly educated people due to a finite supply of jobs and baby boomers hanging on. For me, the operative question is to what extent is this state-of-affairs true for academics (generally) and for science (specifically). There are certainly “aging superstars” to quote from Lucy and she agrees, they should be kept on. The question she is really raising concerns the question of what is best for society: scarce positions for those who are younger and hence command smaller salaries (we could hire more of of them), or viewing experience as “added value”, something to be monetized in the academic labor market. It’s a very complicated question–at least in academia, less so in professional sports. First, tenure is constantly evolving. The system that we have in the United States, created with the notion of protecting academic freedom, has become multi-threaded: the version at many academic medical centers (at large research universities with a medical school) has less to do with guaranteed salary and more to do with faculty prestige and rank. The version at large public research universities without medical schools is often backed by the tuition of students and carries with it, an implied teaching load with the potential for “course buy-downs” from research grants (although almost never to zero). At liberal arts colleges we find that tenure often brings the promise of salary growth (albeit slow and often non-meritocratic), substantial course loads and an explicit obligation to play a personal role in undergraduate education above and beyond the classroom. Tenure in some countries in Western Europe resides nationally and can involve being assigned to a university in a potentially inconvenient town or city. Finally tenure in some places is being rolled back to things like rolling 5 year contracts, with the general expectation of renewal, but no guarantee. But the function of tenure, from my viewpoint, is now much more connected to the ability of institutions to retain talent and reward merit, than the original intent of protecting academic freedom–at least here in the States. That is not to say that tenure isn’t still invoked to protect the free expression of scholarship in the academy–it’s simply to recognize the reality that those occasions are quite rare. One of the most interesting aspects of tenure is that it seems to be transferable within academia. This isn’t explicit, but by and large, having earned tenure at one institution of higher education, subsequent employment at a new school usually carries the old tenure decision forward (perhaps with promotion). This is both an aspect of a competitive market (it would be difficult to recruit a tenured faculty member without the promise of keeping their tenure at the new place) and the notion of tenure as an earned academic badge of merit (as for example the doctoral degree is also a badge). By and large, I think tenure is a good thing. It allows an institute like Krasnow–which is able to grant tenure within George Mason University–to have a competitive edge against elite stand-alone centers which may not. But it is essential to keep in mind that tenure is not a license to dial back and become the proverbial dead wood. With the pro-tenure arguments, you might wonder how higher education is supposed to differ from other sectors of the economy. I believe it is this: given that higher education is in part about signaling and certification, socialization and networking of students, “warm glow” of the donors, and research superstars, the later-period shirking of the typical laggard doesn’t hurt actual productivity nearly as much as the schools themselves might like to think.